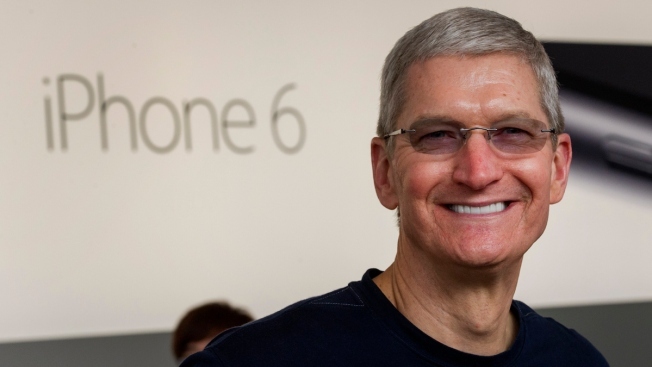 Tim Cook, chief executive officer of Apple Inc., smiles during the sales launch for the iPhone 6 and iPhone 6 Plus at the Apple Inc. store in Palo Alto, California, U.S., on Friday, Sept. 19, 2014. Apple's security guards are attempting to unionize and want better working conditions which seems to mean a higher rate of pay and full-time hours, according to a report. United Service Works West, along with the civil rights activist Rev. Jess Jackson, have called on Apple to create a better workplace for the security guards who average about $19.77 an hour, according to the San Jose Mercury News. Tech companies' use of contract workers to do janitorial, food service, security and drive buses, have arguably created a two-tier employee system. Tech workers get great pay, perks and benefits, while the service workers are paid considerably less and do not have any employee perks such as free onsite lunches, yoga or child care. Google recently put security guards on its payroll, where they will receive all the benefits of a Google employee. The divide is an economic one, but also a racial one, too. The majority of service workers are black and Latino, according to reports. Jackson wrote a letter to Apple chief Tim Cook to look at how its security guards are being treated by their contractor Security Industry Specialists and "urged him to take a stand," the Mercury News reported. "Part of the narrative of their firm is equitable and first-class leadership," Jackson told the newspaper. "As they grow at such a rapid pace, they should have world-class working conditions for their workers from the bottom up." While SIS has argued their pay is higher than average across the Valley, a union spokesman pointed out that many of its listings are for part-time employment rather than full-time -- an impossible amount of money to live on in the Bay Area. The question is whether tech companies with dragon's hoards of cash will put these men and women on their payroll or continue to treat them as contract workers. Putting them on the payroll would mean minimal problems or transition, but for some, perhaps saving that extra bit of cash is worth the negative publicity.